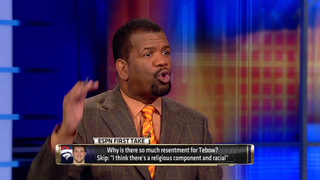 After taking a week to think about it, ESPN has hit Rob Parker with a 30-day suspension for his "brother or cornball brother?" comments. Also, ESPN is promising "enhanced editorial oversight" over the show, which means ... well, I'm not sure what. In a statement, Marcia Keegan, vice president of production who oversees First Take, said race and debate will continue to be cornerstones to the show, which means it'll very likely look exactly the same a month from now. Our review of the preparation for the show and the re-air has established that mistakes both in judgment and communication were made. As a direct result, clearly inappropriate content was aired and then re-aired without editing. Both were errors on our part. To address this, we have enhanced the editorial oversight of the show and have taken appropriate disciplinary measures with the personnel responsible for these failures. We will continue to discuss important issues in sports on 'First Take,' including race. Debate is an integral part of sports and we will continue to engage in it on 'First Take.' However, we believe what we have learned here and the steps we have taken will help us do all that better.